It's been almost eight months since the Federal Communications Commission opened its lawsuit against AT&T for misleading statements on its "unlimited" data plans. Today the Commission announced its intention (PDF link) to fine the wireless company $100 million for failing to notify its customers that going over unspecified data limits on an "unlimited" plan would result in severely reduced or "throttled" speed, well below advertised speeds, violating the 2010 Open Internet Transparency Rule. "Unlimited means Unlimited," said FCC Enforcement Bureau Chief Travis LeBlanc. Other carriers either offered or offer similar plans with similar throttling provisions, but the customer's data allowance before speeds are reduced are typically spelled out in advertising and contracts. A 30-page document (PDF) outlines the Commission's case and AT&T's alleged culpability. 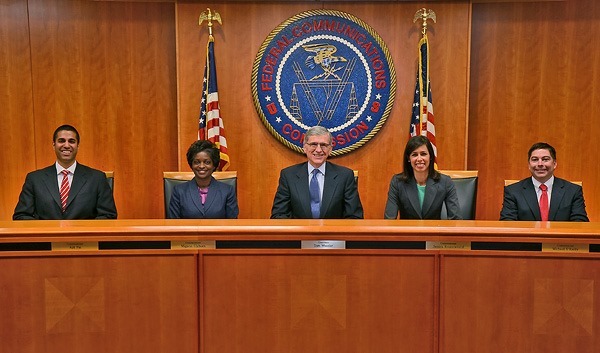 The five current members of the Federal Communications Commission, left to right: Ajit Pai, Mignon Clyburn, Tom Wheeler (chairman), Jessica Rosenworcel, and Michael O’Rielly. AT&T no longer offers unlimited data - what few customers left on the service who still have it are "grandfathered" in, and haven't changed their contracts or wireless plans in years. AT&T spelled out a different policy for throttling, based on users' data use in relation to other unlimited users instead of a specific limit, in a 2011 amendment letter. The Federal Trade Commission is attempting to stop AT&T's throttling altogether, and a federal judge recently rejected the company's attempt to claim common carrier exemption to the FTC's jurisdiction. In addition to a hardline stance on the broad Net Neutrality issue, the FCC has been hard at work policing the larger US wireless carriers over the last year. Sprint was fined $105 million for charging customers for unwanted promotional text messages, T-Mobile was taken to task for allegedly lying about throttled speeds, and Verizon's plans to throttle those few customers left on its unlimited data plans were met with stiff opposition and eventually dropped. We will vigorously dispute the FCC's assertions. The FCC has specifically identified this practice as a legitimate and reasonable way to manage network resources for the benefit of all customers, and has known for years that all of the major carriers use it. We have been fully transparent with our customers, providing notice in multiple ways and going well beyond the FCC's disclosure requirements. An AT&T appeal of the fine is all but inevitable.